For the Churches with same name, see Saint Gregory the Great Parish Church (disambiguation). The San Gregorio Magno Parish (Filipino: Simbahan ng Parokya ni San Gregorio Magno; Spanish: Iglesia Parroquial de San Gregorio Magno), also known as Majayjay Church and St. Gregory the Great Parish Church, is one of the oldest Roman Catholic churches in the Philippines located in the municipality of Majayjay in Laguna. It is recognized by the National Museum as a National Cultural Treasure (Level 1). The current parish priest is Father Robin A. Dagala. A century later, the stone church was destroyed by typhoon and was repaired in 1839, 1842 and 1848. The roof was replaced with galvanized iron in 1892 under the supervision of Father Gregorio Platero. During the American occupation, the church served as headquarters of the American army. Due to damage brought about by the Spanish and American revolution, the church was again repaired in 1912. In 1954, the church was placed under the government's rehabilitation program with the help of the National Conservation Society of the Philippines. In 2001, it was declared as a National Cultural Treasure by the National Museum. The Romanesque church of Majayjay is 60 metres (200 ft) long, 17 metres (56 ft) wide and 16.5 metres (54 ft) meters high. Its façade has three levels, each level scaled proportionally and topped by a triangular pediment with a circular window. The central nave consists of a huge wooden door of the main portal, choir loft windows and saint's niche. The interior contains a retablo mayor and four other minor retablos with intricate designs. The floor is tiled with azulejo and the walls have been preserved with some alterations. The five-storey square belltower with a conical roof and ballustrated windows on each polygonal level is connected to the langit-langitan, a cat-walk above the ceiling which leads to the crossing over the transept. The belfry has arched windows each with a bell trimmed with finials and a large antique bell on top. It also has a large side door on the right side of the church. Today, the church contains antique images of santos, reliquaries and century-old liturgical objects. The huge convent (also convento) of the church, which provides a good view of Laguna de bay, is one of the best preserved convento in the country and is the earliest surviving example of its kind. It houses a small museum of old parish documents and ecclesiastical silver. A small portion of the church was converted into the present-day Liceo de Majayjay, a Catholic school under the supervision of the local parish and the Diocesan Catholic School System of the Roman Catholic Diocese of San Pablo. The chapel of Nuestra Señora de la Porteria (Our Lady of the Gate) also known as the Ermita chapel was originally constructed as a tribunal during the Spanish period. The image of the Nuestra Señora de la Porteria, which was brought to Majayjay by Spanish missionaries in 1759, was enshrined in the former court building in 1760. ^ a b Alba, Reinerio (September 29, 2003). "The Restoration of 26 Philippine Churches". National Commission for Culture and the Arts. Archived from the original on May 12, 2014. Retrieved June 20, 2014. 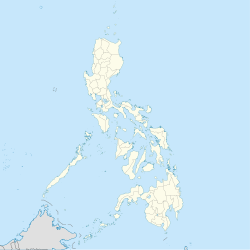 ^ "Majayjay, Laguna's cradle of Christianization five centuries hence". October 17, 2012. Retrieved June 20, 2014. ^ a b c Trozado, Pablo (September 26, 2010). "Majayjay's 280-year-old angel in stone". Philippine Daily Inquirer. Archived from the original on October 29, 2014. Retrieved June 20, 2014. ^ a b "Towns and Cities - Majayjay". Retrieved June 20, 2014. ^ a b c d "Bells of St. Francis". OFM Philippines Archives. Order of Friar Minors in the Philippines. Retrieved 25 November 2014. ^ "Laguna's old churches await pilgrims". Philippines Daily Inquirer. March 24, 2005. ^ a b "Majayjay Church : St Gregory the Great". April 1, 2014. Retrieved June 20, 2014. ^ "Tourist Attractions in Laguna - Religious". Department of Tourism. Retrieved June 20, 2014. Huerta, Felix de (1865). Estado geográfico, topográfico, estadístico, histórico-religioso: de la santa y apostólica provincia de S. Gregorio Magno, de religiosos Menores descalzos de la regular y más estrecha observancia de N.S.P.S. Francisco, en las Islas Filipinas: comprende el número de religiosos, conventos, pueblos, situación de estos, años de su fundación, tributos, almas, producciones, industrias, cosas y casos especiales de su administración espiritual, en el archipiélago filipino, desde su fundación en el año de 1577 hasta el de 1865 [Geographical, topographical, statistical, historical and religious state of the holy and apostolic province of S. Gregorio Magno] (in Spanish). Binondo: Imprenta de M. Sanchez y Ca. This page was last edited on 25 February 2019, at 12:10 (UTC).